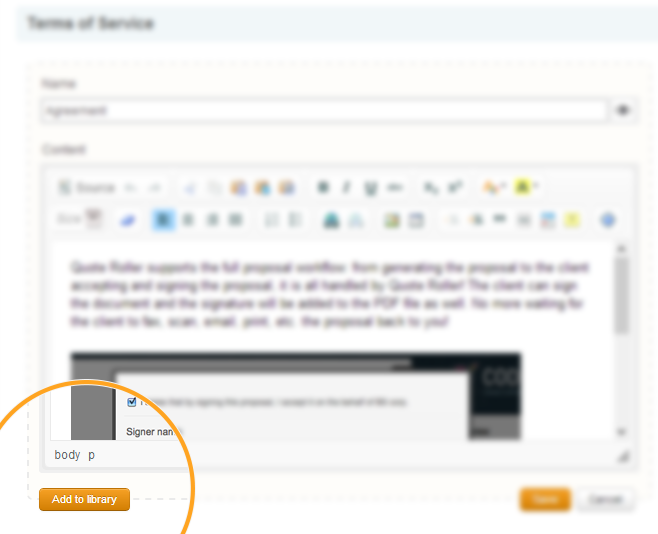 We always add features to Quote Roller to help our users be even more efficient. Some of you might have already noticed that blue Content Library button has appeared while creating or editing proposals and templates. Content Library works as a repository of content blocks you use most often in your proposals. Be it text, images, HTML, video or a combination of all the elements, you can now conveniently save any block into your Content Library and with a single click add it into other proposals. If you have already created several proposals and have templates with Quote Roller, great way to quickly populate your Content Library is to go through your templates and proposals, enable Edit mode and add blocks, which you would like to be at hand. You will notice that new item is available in your Content Library and you can now add it into any proposal or template. Items inherit block’s title as their name. When you have the necessary blocks of text, images, video or even HTML ready at your disposal in your Content Library it’s time to be more productive! To add items from your Content Library simply locate the necessary block you wish to add and click green Add button. No more copy and pasting! Transfer any information from your old proposals into new ones on the fly without keeping several tabs open or going back and forth between two proposals. Have you tried new Content Library feature already? What do you think?